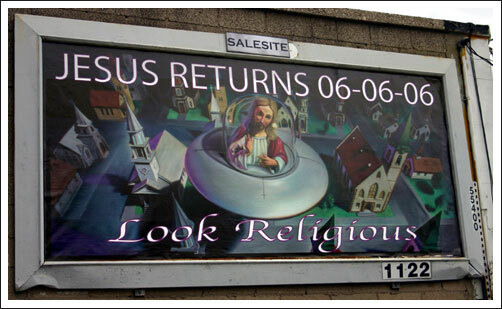 Today is 6/6/06, which means Jesus will descend in a Jetsons-type spaceship to battle satanic forces of evil, possibly including the Burger King or perhaps Baby Ronald. That’s according to this New Jersey billboard, anyway, which we first wrote about in April. It’s still unclear whether this is part of a marketing campaign or what. It doesn’t seem to be connected to The Omen, which opens in theaters today. We visited the Omen Web site this morning and came across the “666 FAQ” (“fearfully asked questions”). Among them: “Q: Am I safe from the mark of the beast if my social security number, phone number, address, or license plate includes 666? A: No. Identifying numbers including 666 are signs that you will give in to the power of the Antichrist.” Unless Jesus swings by in his spacepod. UPDATE: This ad seems to be the work of an artist named Ron English, who enjoys posting illegal billboards.